We’ve started growing lettuces and microgreens in our apartment!. I doubt my husband would have agreed to eat this a couple years ago, but after having this colorful fall salad he asked for some of the same ingredients in his lunch the next day! That’s pretty awesome. 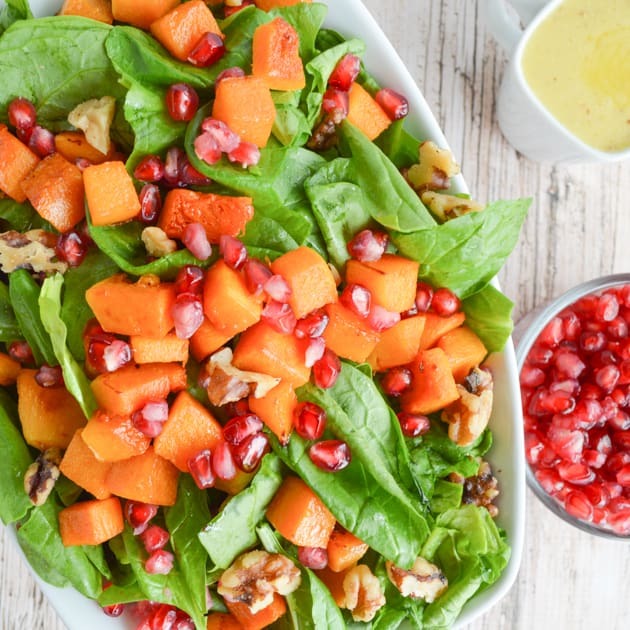 I hope you enjoy this butternut squash, spinach, and pomegranate salad as much as we have! The new favorites from this salad were pomegranate seeds and the honey vinaigrette dressing. We’ve already eaten both again in the time between photographing this salad and writing up the recipe! I know you can sometimes find jars of pomegranate seeds in grocery stores, but I figured out a really handy trick for seeding one at home. 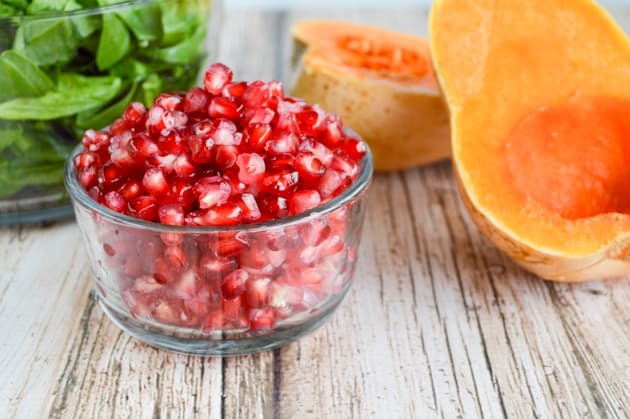 Although pomegranates are never inexpensive, one has more than enough seeds for a week’s worth of salads and seeing the fruit yourself is less expensive than buying the seeds. The problem is that pomegranate juice stains. As in, it really, really stains. So how can you make a pomegranate more manageable? You cut the pomegranate in half, submerge the halves, and then scoop the seeds out underwater! If you’re better with knives than me you could cut it underwater, but I’m not willing to try. When you extract the seeds in water, it makes it far less likely that some will go shooting off into space or that juice from a punctured one will stain your clothing or countertops. Very cool! An added bonus is that the seeds sink in water, but the white membrane pieces float, which makes separating the two easier. I know it’s difficult to look at a recipe that says “use 1 1/2 cups of butternut squash” and know how that relates to an actual vegetable. As you can see in the pictures, I had a fairly small squash, and I only used half of it for this recipe. You could always use more, if you want, but I find its sweetness a little overwhelming in larger quantities. If you can’t get enough of this fall vegetable, then cube and roast away! Once the oven has heated, combine the squash cubes, 1 tablespoon of olive oil, and maple syrup in a bowl and toss to coat the squash. If some of the cubes look dry, add a little more oil. Spread the squash out on a heavy duty baking sheet and roast them on the oven's middle rack for 10 minutes. Use tongs or a spatula to flip the cubes and then roast until they are tender, but not falling apart, and starting to caramelize, 10-15 minutes longer. 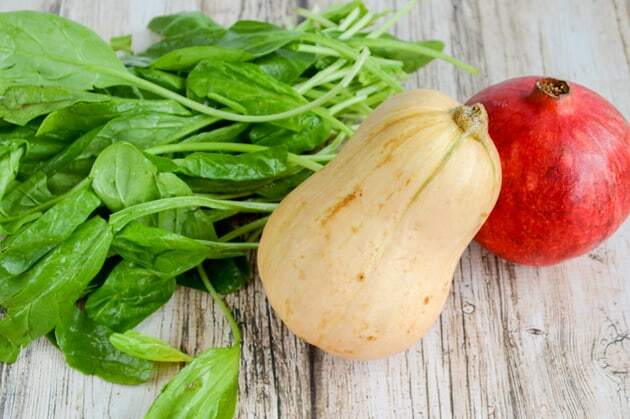 Once the squash is ready, place the spinach leaves in a salad bowl and layer the squash, walnuts, and pomegranate seeds on top. The whole salad can be refrigerated until you're ready to serve it, or you can eat it now with the squash still warm. Combine the 1/4 cup of olive oil, garlic, honey, mustard, and salt, and cinnamon in a food processor or blender. Puree to thoroughly mix ingredients. Do a taste test and adjust to suit your palate. If it's too sweet, add more vinegar. Too tangy? Add more honey! Store the dressing in an air tight container in the fridge until you're ready to use it. If it has been refrigerated for several hours or longer, you may need to let it come to room temperature (so the olive oil can melt) and shake it to recombine the ingredients. Ours stayed pretty well blended, so we just poured it on! When you're ready to eat the salad, dress it and serve. As you can see in the photos, I layered the salad rather than tossed it all together. 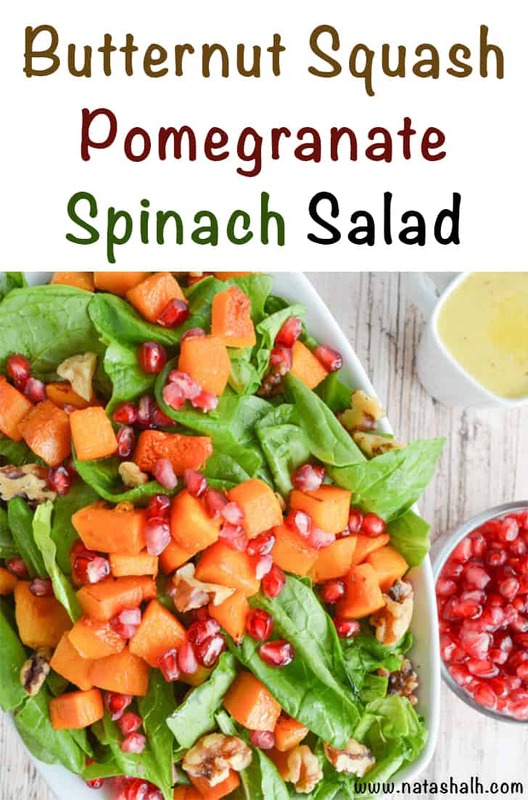 The spinach leaves are so large in comparison to the pomegranate seeds and walnut pieces that they will sink straight to the bottom of the bowl as soon as you stir. To make sure everyone gets their fair share in the first helping, I think it works best to layer, as shown. We only used about half the dressing on the salad, so we simply stuck the rest back in the fridge and used it the next day. As soon as I get a useful glass jar with a lid (read as: once I’ve finished off the pickles or Kalamata olives), I plan to make a big batch for more regular use. Then I’ll need a second jar because I want to make some pomegranate vinaigrette, too! If you read the label on commercial salad dressings, you’ll also want to make your own right away. 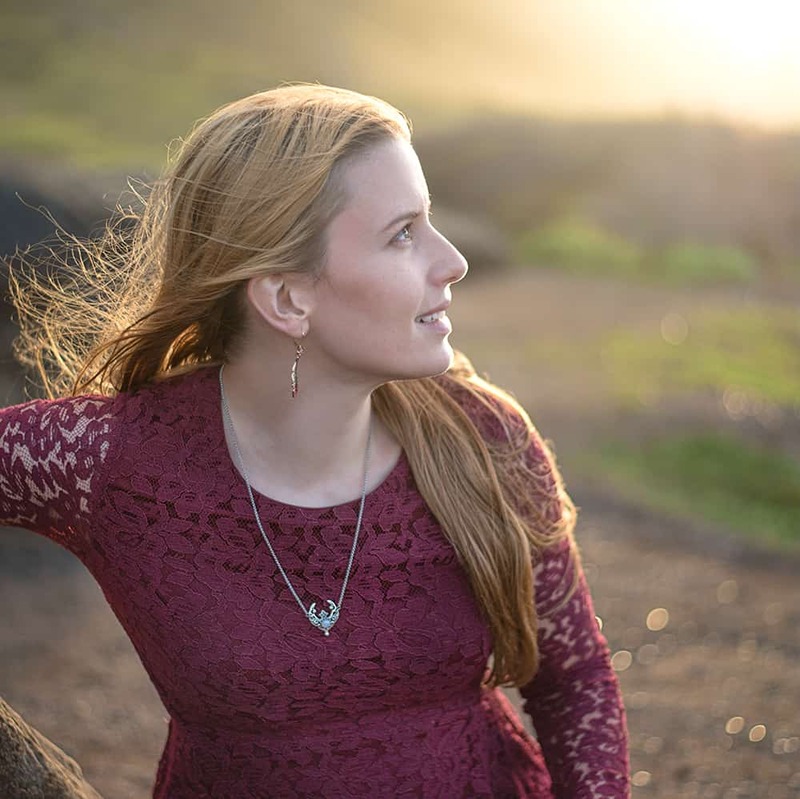 We looked at our (previous) favorite and found three sweeteners, one artificial sweetener, and a variety of other stabilizers, additives, preservatives, and seaweed extracts. Sure, this homemade dressing has honey in it, but at least I know there isn’t a laundry list of preservatives! Are you looking for more fall recipes? 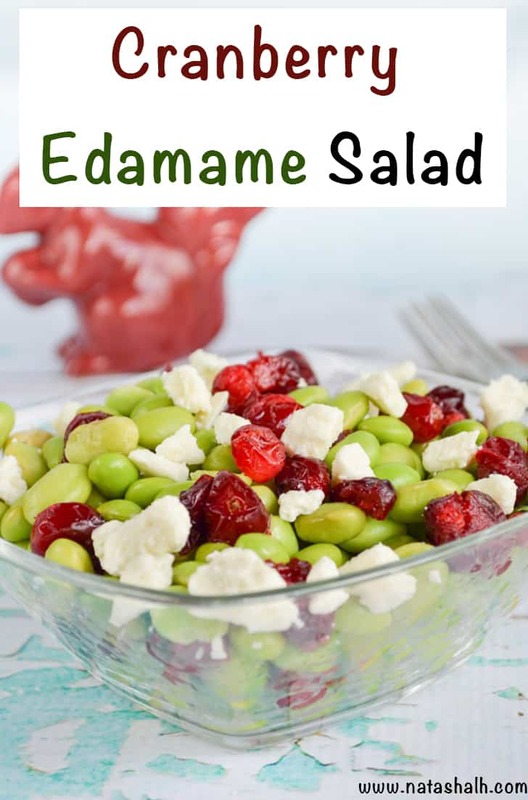 You might enjoy this cranberry edamame salad! Have you tried making your own salad dressings or other condiments? I really want to make mayonnaise, but I can’t find pasteurized eggs and don’t feel totally comfortable using non-pasturized eggs, even free rage ones.